How Does a Board of Directors Normally Work? Boards of Directors have varying degrees of authority, responsibility and power, depending on their corporation's Articles of Incorporation and Bylaws. Often, a Board of Directors is a rubber-stamp entity that upholds the decisions of the company's chief operation officer. The larger the corporation, however, and the greater the extent of its involvement with investors' money, the more hands-on the Board of Directors will usually be. The number of meetings per year, the ability to call special meetings, the fiscal reporting procedures, the method of electing officers and the delegation of responsibilities for carrying on the day-to-day affairs are all mandated by the articles, bylaws and minutes of the meetings (particularly the first meeting of the Board of Directors) that identify and set rules and precedents for the maintenance and operation of the corporation. Regular meetings are the forum during which the corporation makes its key decisions and sets its primary policy. In some companies, the board meets once or twice a year; in others the board might meet monthly. Each meeting is traditionally comprised of a beginning, which notes those present and those not present, and reads and approves the minutes of the prior meeting. Then the floor is opened to discussions of old business and reports (financial, creative, planning, for instance) and moves into new business. 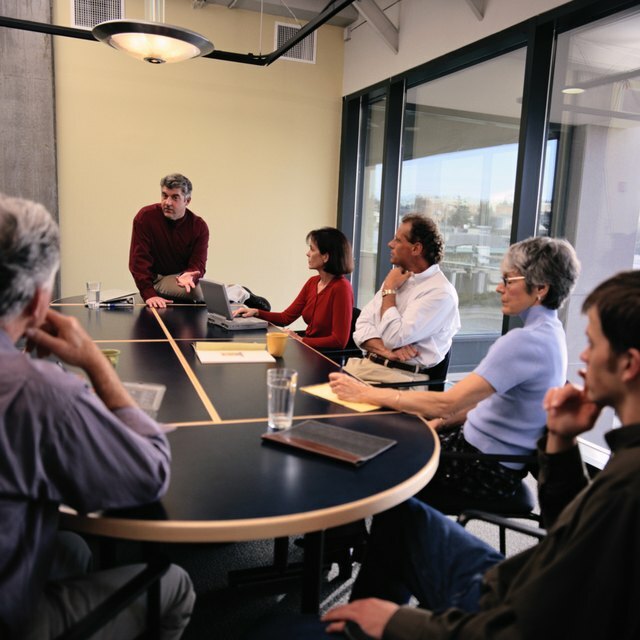 Committees are often formed by large Boards of Directors to do interim work between meetings. Committee reports will then become a part of the meeting schedule. Often, fund-raising and fiscal discussions are continuing agenda items during the meetings. Minutes are kept, votes are taken when appropriate, and the chairman assigns follow-up tasks to staff and assistants. Sometimes meetings of the board can be scheduled in some neutral city and can take 2 or 3 days to complete, and months to plan. The chairman of the board or the president of the company or their designates will chair the meetings. The original members of the Board of Directors were established in the bylaws, as was the method of electing new members. Often a board whose members begin in perfect sympathy will devolve into bitter arguments over the direction of the company, particularly during the first years of financial success. Depending on the size of the company, the amount of board members could be as few as 3 or as many as 25 or more. Often, when the number of board members is over 10, the chairman has to be aware of the psychological, political and historical chemistry of the various members of the board. He or she must know where the next fight could come from. The company's vision must be carefully protected in the midst of what often becomes out-of-control egos at war over nothing at all.